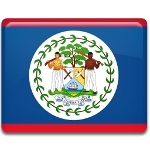 September 10 is National Day in Belize. This holiday celebrates the day, when Belize gained independence from Spain in 1798. Originally the territory of what is now Belize was settled by the Maya civilization. The Spanish conquistadors explored the land and declared it a Spanish colony, but at the end of the 17th century English and Scottish pirates and settlers (known as the Baymen) entered the area. They were allowed to stay in exchange for an end of piracy. Long lasting arguments between the Spanish and the Baymen over the territory led to a military engagement, that is known as the Battle of St. George's Caye. The battle lasted since September 3 till September 10, but its last day is considered to be the most important. The Baymen defeated the Spanish fleet with no causalities on each side. Several years later Spain attempted to conquer the territory, but it failed. The last day of the battle is celebrated as National Day and Belizians commemorate the first people defensing their territory.